You won’t have to struggle with motivation. Many people get really excited at the prospect of beginning a project and working on it by themselves, and as they get into it they realize that the job is way bigger and more time consuming than they’d originally expected. As a result, they wind up with a half-finished job and a bigger mess than when they first started. Professionals are guaranteed to stick with the project through its entirety. You’ll have guaranteed expertise. Professionals are guaranteed to have the expertise required to do the job and do it well. If you have any questions at all about your own personal skill level and whether or not you’d be able to do a good job of the project, it’s better to just reach out to a professional and avoid all doubt. You can spare your personal time. Doing a remodeling or renovation job by yourself is a huge time commitment, which means it will eat into your personal time for a very long time. Professionals can commit many more hours per day to a job, with more than one person working on the project at all times. You can spare your personal time while getting the job done quicker. You can trust that the job will be done safely. Professional renovators and remodelers understand not just how to do a job well, but how to do it safely. They have all of the proper tools and follow all necessary procedures to ensure that there is no risk of harm to anyone in your home or to the rest of your home itself. Creative Renovations wants to help you with your next home remodeling project. For more information about how we can assist you in creating the home of your dreams, contact us today! We look forward to working with you. In many houses, the kitchen is truly the center of the home. Therefore, it’s often one of the biggest targets for renovations and remodels. However, it can be a big undertaking to renovatie your kitchen to the form you wish it to take. This causes many people to resist committing to a remodel, even if their kitchen desperately needs to be overhauled. Deterioration. Whether it’s cracked tiles, broken countertops, warped cabinets or outdated appliances, there is likely to be some form of deterioration in your kitchen if it hasn’t been touched in decades. At some point, a kitchen has simply outlived its original usefulness and needs to be remodeled. Value. If you know that sometime down the road you’re looking to sell your home, a freshly renovated kitchen is a great way to increase your home’s marketability. A brand new kitchen will be much more likely to grab the interest of potential buyers, and will increase the value of your home. Energy efficiency. Are you wasting a lot of energy in your kitchen? A remodel could bring in more sunlight, or give you energy-efficient appliances that will help you to sve on energy costs. Special needs. If anyone in your family has special needs of any sort, it’s a good idea to remodel your kitchen to accommodate those needs. Lifestyle. The original homeowner likely designed the kitchen to best suit his or her lifestyle. Why not adapt your kitchen to fit your lifestyle, rather than the other way around? Add a breakfast bar, more cabinets, knock out a wall or increase your counter space; your options are limitless! Better cooking options. If you are a more advanced cook and would like to upgrade your kitchen to accommodate your abilities, then a remodel is an excellent idea. Novice kitchen setups can really limit what you can do as a gourmet cook. Whatever reason you have for remodeling your kitchen, Creative Renovations is here to work with you throughout the entire process. Contact us today to discuss your potential project and to get a quote; we’re happy to work with you and answer any questions that you have about our services and how they can benefit you. For many companies in all different industries, it can be a difficult decision to remodel their business space. Business owners dread the down time that comes with a remodel, and the larger the project, the more potential down time that a business has, especially if it doesn’t have a temporary premises from which to operate. There is also taxing process of actually getting everyone out and getting things set up in the space for the remodel to occur. In the short term, it’s a stressful prospect that could cause quite a few headaches. It’s a big confidence builder. By renovating your business space, you show your employees that you believe in them and the business, enough so that you’re willing to put the money into a remodel and deal with the hassle of organizing it. It’s rejuvenating. There’s nothing like working in a brand new space that has been specifically designed for the needs of your business and its employees. Your employees will feel remarkably refreshed and rejuvenated when they begin working in the freshly renovated space. It’s exciting for customers. If you have a retail location, a restaurant or something where customers come in and use the space as well, your remodeling will spur some excitement in the community. It’s easy to create word-of-mouth advertising among your customers when a remodel is happening. It’s a potential way to increase sales. When you’ve got a freshly remodeled building, customers are going to want to come in and check it out. This is likely to give you an increase in sales. It’s a great way to make your business unique. A special design for your business will do wonders for driving sales. When done correctly, a great store remodel will better direct traffic throughout your business and encourage more sales. 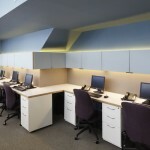 There are many benefits to remodeling and renovating your commercial space. Once you get past the initial commitment, it’s clear that, in the long run, there are many reasons why you should consider it for your business if your facilities are outdated.